Another great day on the bike. The cold and my desire to have bacon the eggs for breakfast saw an 8 am start. Temp was 9 c then but with yet another fine days the sun quickly saw the temp start to rise and my clothing start to come off. Reached 26 c by the afternoon. 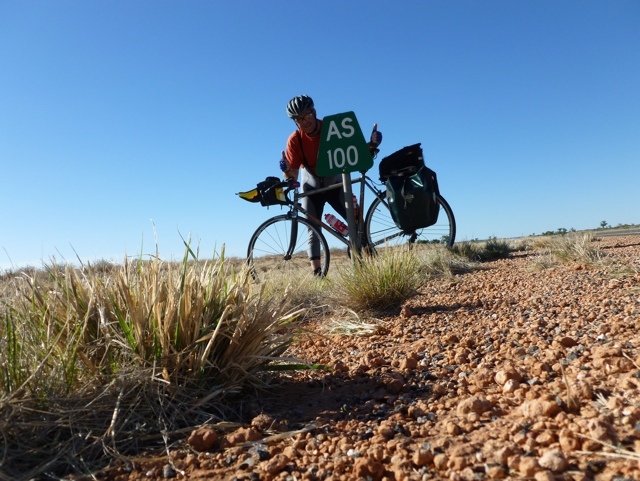 Knocked out the first 74 Kms to Eirdunda – turn off to ayers rock – in quick time with a a handy tail wind that saw a plus 30 average. 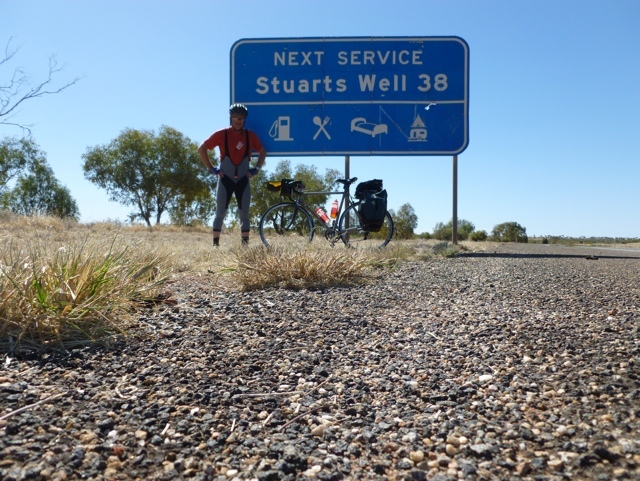 Was great though to be able to stop for a little bit to eat and a coffee before the final 108 Kms into stuarts well. The land changes here and a few craggy faces and small valley climbs and evidence of inland rivers – mostly dry. Flies now a nuisance if you stop – but the good thing is that when you remount the bike you can cycle away . This unlike the Alaskan highway where they have these real aggressive horse flies that can take a bite that eats a small chunk of your flesh. Evolving with fast moving herds of caribou – they are much more difficult to ride away from. the wind assistance was not there for the last half – seemed to swing about every which way. was pleased finally pull into Stuarts Well at just after 4pm. My first day leaving Adelaide – I struggled to make 100- and I wondered if I was going to warm to this big task. Now I have done 2 180 km days end on end and feel much better than I did at the end of day one. Feels great to be alive. 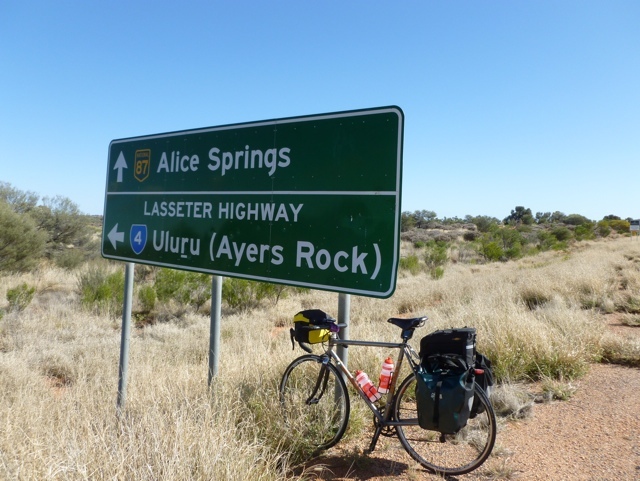 – fit and well and only 90 Kms from Alice Springs. A pleasant surprise as Charles and I are back together again for the final run into Alice. He rode for 3 days – I did 2 big days. . They cooked me a special order for dinner last night – the kitchen grumbled at it – but a large mixed grill arrived on one plate and a full second plate with cooked vegetables. Think the body needed lots of replenishment after so much exercise. Then came the entertainment. Dinky the singing and piano playing Dingo. Kid u not! There was an audience of perhaps 18 tourists – grey nomads- and Jim the proprietor – raconteur and owner of Dinky tells his ( very long winded) tale. One of Dinky’s claims to fame is that there is a question about him in trivial pursuit. – something like where does the Australian singing and piano playing dingo live? other interesting trivia is that while the Aussy Abo’s have been here for upwards of 60 – 80,000 years ago – academics believe that the dingo has only been in australia for a short time – as short as 5000 years . 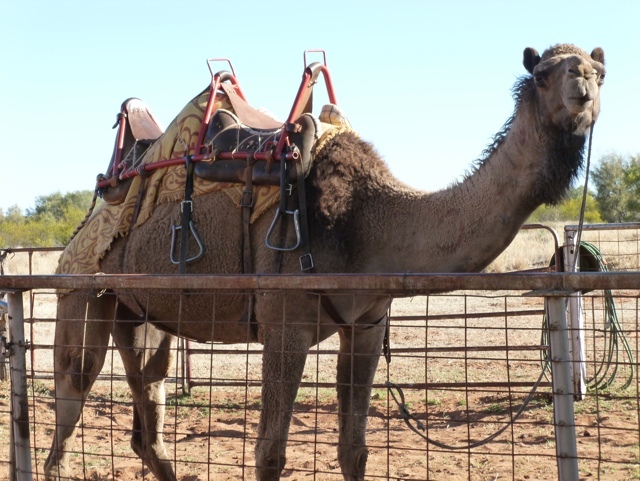 Jim was also very entertaining – disabusing us of the notion that Australian parents in the NT bring up their children by sticking their fingers down dingos throats! Too cute. lexi looks like she has gusto. And your wntiirg is great. Keep wntiirg. Share your blog with Norma, she’s also a foodie!